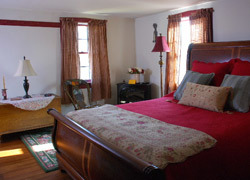 Located on the east side of the house the Henry Room is the perfect spot to wake up to the morning sun. Named for Henry Irwin, a cooper by trade, his barrel shop was located in the present orchard. 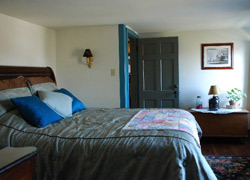 The room offers a queen size sleigh bed, an antique Pa German blanket chest, an oriental rug, random width wooden floor boards, a private bath, and a fabulous view of The Cooper's Inn farm fields and fruit orchard. Solomon Irvin, innkeeper Audrey's great grandfather farmed this land. Hanging in the room is a tobacco leaf sizing box hand made by him. 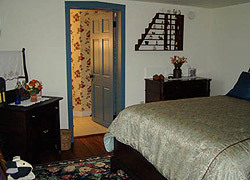 The Solomon Room offers a mahogany queen bed, an antique walnut washstand, an oriental rug, random width wooden floor boards, and a private bath. 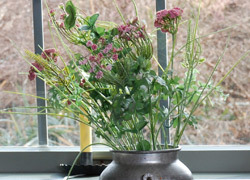 Sit on the rocker by the window and see the view of the fruit orchard and a seasonal view of the mountains. Morris Irvin innkeeper Audrey's grandfather lived on this land. 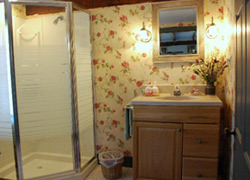 He built the tobacco shed and converted the Pa German bank barn for tobacco farming. 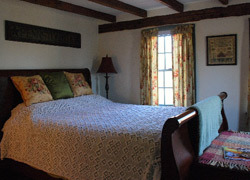 The Morris Room offers a queen sleigh bed, a Pa German blanket chest, an oriental rug, a private bath, random width wooden floor boards, and exposed summer beam and ceiling joists. 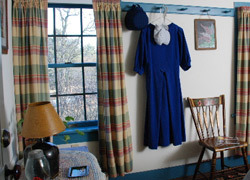 Enjoy watching all the different birds in the meadow right from your room's window! Breakfast is served every morning in the Keeping Room. 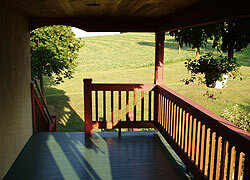 The morning sun welcomes guests as they descent the stairs from their rooms. 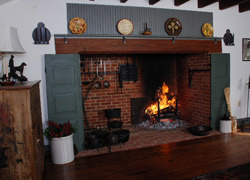 A perfect place for conversation or to relax in front of the fully functional cooking fireplace. 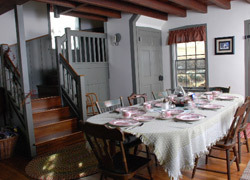 Keeping Rooms were used as the central entertaining and dining areas of the colonial home. 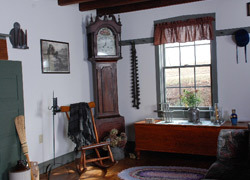 This room is tastefully decorated with antiques and family heirlooms including a tall clock, a Pa German jelly cupboard, a Pa German flour chest, and a farm table. 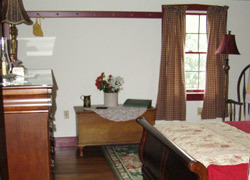 The room has random width wooden floor boards and an exposed summer beam and joists. What better place to meet other guests. 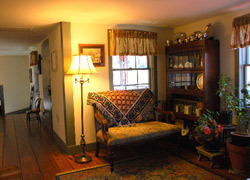 The gathering room is a special place to sit and plan your day or end it by playing board games or taking in a novel. 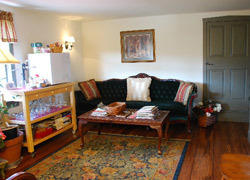 Early morning coffee and tea will be available here. Early risers may want to retreat to the near by balcony to sip their beverage and experience the peace and tranquility of the country morning. Located within minutes of antique markets, historic areas, fine restaurants, theaters, and shopping outlets, there is something for everyone. Check-in time is 4:00 PM. Check out time is 11 AM. 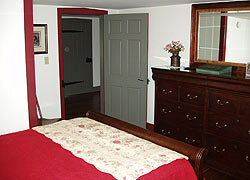 Cancellation Policy: A $15 cancellation fee will be charged for all cancellations. If you cancel your stay 14 days prior to arrival your deposit will be refunded. If you cancel your stay less than 14 days prior to arrival your deposit will be refunded only if we are able to re-rent the room for your entire stay.